Capcom Japan is currently producing two new arranged albums to be released early this year, featuring songs from both the classic Rockman and X series. With Rockman Utopia due in a matter of weeks, E-Capcom has rolled out our first look at Dystopia. It's a hellish piece, perfectly suited to the style of music the album promotes (hard rock and techno). The best part, though, is the parade of wireframe Sigma virus heads. Maybe we'll be hearing one or two X2 arrangements? 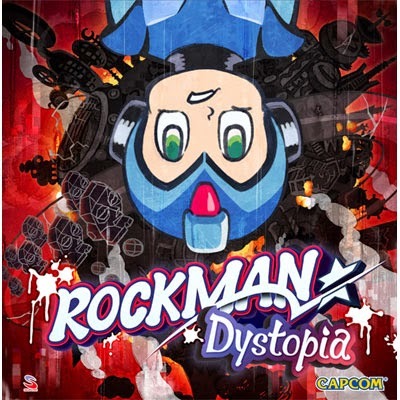 Rockman Dystopia hits stores February 11th. I'll be happy as long as it has a remix of Zero's Theme. I was hoping for some samples like the other album. Seriously, I listen to those samples as if I owned the album, on an often basis, it's that good! If this one is like that as well, I'll be needing both these albums ASAP! I am so seriously amped up for this,particularly Rockman Dystopia.I trust it includes some dark gabber notwithstanding the undeniable drum & bass it will unquestionably incorporate.I'm going to import the poop out of these. I like how the whimsical-looking font of the title is juxtaposed with that bleak artwork.